Bale hay, mow fairways, plant soybeans or corn, spray or harvest corn and more - it’s up to you to do the job right! See what you can do with 500 horsepower of Green Machine! - Choose from over 15 John Deere vehicles and implements including the 9860 STS Combine, 8530 Tractor and 4930 Sprayer. - Complete each job with precision and efficiency to receive bonus Deere Dollars. A job well done is a job well paid. - Grab your gloves and hat and hop on an authentic John Deere branded equipment. 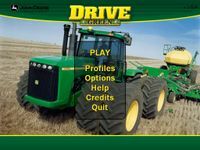 - Collect and use Deere Dollars to unlock vehicles and implements for your farm.